At Muscleworx Physical therapy & sports injury clinic we provide hands on treatment for all sports, work, postural & accident related injuries. We favor a hands on approach, which will usually involve deep tissue massage, dry needling, mobilisation and muscle stretching techniques. We also specialise in Kinesio Taping and Frequency Specific Microcurrent techniques. Mark Mc Cormick is a member of the ANMPT ( Association of Neuromuscular Physical Therapists) and is recognised by LAYA ,GLO Health and AVIVA Health insurance. 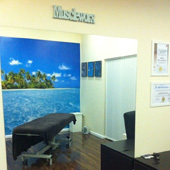 Treatment is by appointment only click here for the booking form. You can also contact Mark Mc Cormick at 0862783627 or email Mark at muscleworxnmt@yahoo.ie.